Esri's Joseph Kerski (@josephkerski) made a suggestion this week regarding the hashtag #GISED and the Esri twitter account @gised. I find the hashtag and account quite valuable. The most active users of the hashtag are Esri folks (Kerski, @trbaker, and @GISEd), AAG GeoMentors (‏@AAGGeoMentors) and me (@adenas). I use the tag to highlight content of interest to those involved in GIS education, using any technology. I'd love to see more GIS education tweets tagged! You know what didn't get the #GISED hashtag on Twitter this past week? The Discovering Liquid Water on Mars story map. It got a lot of praise including these terms I found in tweets: "fantastic, " "awesome," "stunning," and "amazing." The story map prompted lots of questions for me. What questions? I wrote them down as I worked through the story map. Each number below is a "dot" in the story map table of contents. 1) I really liked the opening time series from Horowitz Crater that shows the changes in the streaks made by water over time. I guessed that the MY had something to do with the Martian Year and looked up the details. The data shown in the time series are from 2006 through 2011. 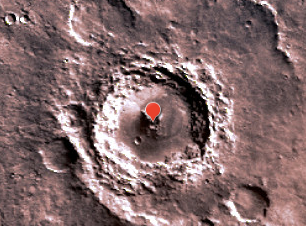 I clicked where indicated to "see Horowitz Crater on a satellite map of Mars." Since I have no specialized knowledge of Mars' geography the locator map didn't mean much to me. I wanted to see where the crater was on the globe of Mars. For example, was it northern or southern hemisphere? 2) Next was a video of similar streaks on Hale Crater. I wanted a link to the source video so I could get more information about the time frame covered. I think I found the video source here. I also wanted to know where Hale Crater was relative to Horowitz. I tried a few online Mars maps including NASA's Mars Trek and Google's Mars Map but didn't find an answer. 3) The next image showed Garni Crater with multiple streaks "many of them several hundred yards long." I found it cool to know how long they were! I wanted a scale so I could perhaps see how long they were in relation to other features. I found more information on the image in a NASA image of the day post. 4) Palikir Crater, like Horowitz, includes a time series. Did Esri create the two time series? I can't tell from the credits/sources. The story map collects a lot of interesting images and animations and raises many geographic questions that require additional research to answer. That makes it a great starting point to learn about spatial thinking. The story map reinforces the value of time series imagery to show change over time. What questions did the story map prompt you to ask? Did you follow up to try to find answers? Did you/would you use the story map in a geography or science class? How? The Atlantic slave trade between the 1500s and the 1800s brought millions of workers from Africa to the southern United States to work on agricultural plantations.